By 2020, 77% of the US population will be using mobile technology daily. It’s the go-to technology for personalized communications. Personal means connecting with customer routines, moods, and of course, discerning taste buds. Data makes it possible—mobile makes it deliverable. Leveraging the mobile platform is key in any marketing strategy to attract customers effectively. 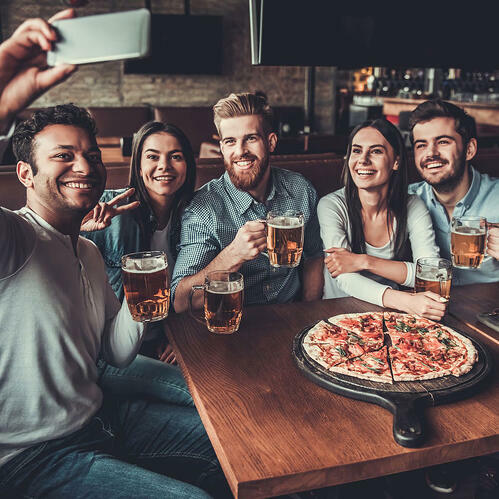 Whether utilizing loyalty apps or marketing automation, here’s some tips and strategies to keep customers coming back to your restaurant. How to Develop a Restaurant Marketing Strategy in 9 Easy Steps. Grow your online visibility. Restaurants that claim their business on Google and Yelp greatly improve their search rankings and gather more customer reviews. Just don’t forget to keep it current. Many restaurants don’t update their Yelp pages adequately, failing to fill in contact information or even claim the listing. Wrap it up then in a consistent, original tone and style—your brand—to make it easier for diners to find you online. Have a flexible digital strategy. Your digital media strategy should be flexible so you can respond to what does and doesn’t work for diners. Discover how your customers found out about you to gauge where they’re spending time online so you can maximize that platform. Cross-link all your online profiles—you never know where your customer is, but you can likely find them. Link your site to your mobile app, and both to your social media pages. You’ll build followers on the customer’s preferred platform. Move with the mobile direction. Most consumers expect information to be available at their fingertips. When deciding where to eat, over 90% of people search for information about restaurants on their smartphone, and 84% of them contact a business as a result. An app with your menus, reservation, ordering, payment and delivery capabilities keep you accessible and convenient. Isn’t that what everyone wants? Leverage different social media sites. Diners love to see your fare before deciding where to eat. Instagram and Pinterest are perfect for enticing people with tasty-looking photos. Consider making short, unique videos as well, such as your chef’s cooking techniques or a quick recipe. Then use trending hashtags to increase post visibility . For example, include #happyhour, #brunch, or #foodielife. And consistently include a regular hashtag—the name of your restaurant. Offer online reservations. If you only take reservations by phone—or don’t offer reservations at all—consider this. According to OpenTable, 83% of diners want to be able to add themselves to a waitlist and get notified when a table opens up. In an on-demand world patience isn’t popular, so simplify reservations and minimize wait time by doing things digitally. Skip the loyalty punch card. Deliver rewards digitally. Your regulars expect a loyalty program. Trouble is, more often than not their punch card is in the car, trapped behind a fridge magnet, or in the kitchen “stuff” drawer. If you really value your patrons, reward them automatically through your personalized app. We can guarantee this—their phones aren’t in the “stuff” drawer. Extend your reach with blogs. You don’t even have to post solely about the restaurant. Diners like to read about different employees, recipes, diet and nutrition facts, and current news about your restaurant. Keep it fresh and educational to showcase your expertise and build engagement with followers. Respond to and request reviews. One of the best ways to make your guests feel like their concerns are heard is by responding to their online comments. If they have a complaint, tell them how you have solved the problem and offer them a discount on their return visit. Yelp reviews can bring a huge increase to your business as well, so remind customers to fill them out. Just a half-star bump in your Yelp review can bring a 27% increase in business. Get involved in community events. Partnering with organizations and getting involved with local promotions not only builds awareness, but increases business on the day of the event. For example, offer discounts if they dine with you after events and throw in a free cocktail or beer if they have downloaded your app. Apply for local business awards also to gain recognition and stay top of mind.